Formation of a company in Germany – which legal form? 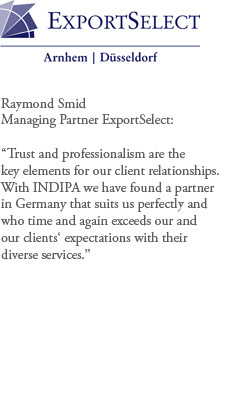 - INDIPA - your partner for the German market! Formation of a German company? Which legal form would suit you? 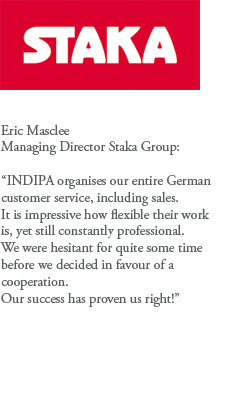 In the last few years, INDIPA has successfully supported far more than 100 company formations in Germany. 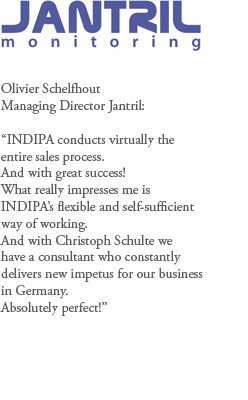 The formation of a company is very much still a formal and paperwork-intensive process in Germany. 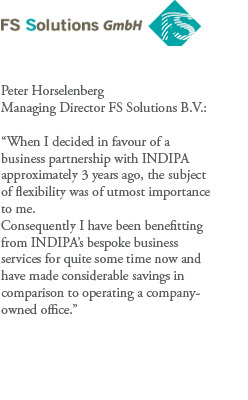 INDIPA has optimized all the steps so that the effort for the expanding company is minimal. Many company owners think initially of forming a „GmbH“, to expand internationally and approach us asking for professional guidance. But the forming of a „GmbH“ is only one of many possibilities to position oneself in the German market. There are various organisation forms available to become active in Germany. The first question is – who wants to form the company? There are different possibilities whether you are a private person or an American company. If it is just a question that an American company wants to open a subsidiary in Germany, then there are two possibilities. One can open an independent subsidiary („selbständige Zweigniederlassung“) or a dependent subsidiary („unselbständige Zweigniederlassung“ or „Betriebsstätte“). If however, one wishes to form an independent German organization, then one can choose between various legal forms. The most common legal forms are „GmbH“ and „UG“. The bigger „AG“ is not an issue for most small to medium sized American companies. 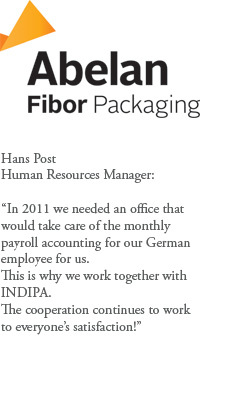 In any case, a company formation in Germany is still a formal and paperwork-intensive process. That means an online company formation is impossible. What makes a „GmbH“ so attractive as a legal body? 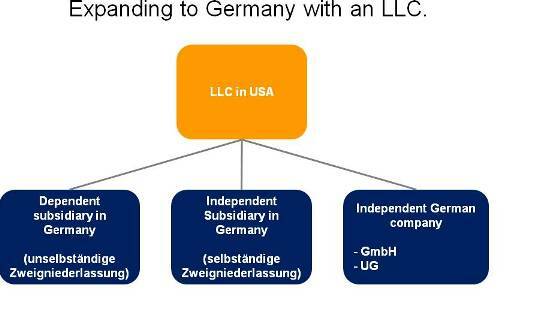 The “GmbH” is comparable to the LLC. in the USA. A „GmbH“ is not publicly owned, but rather privately held. In other words, the shares of a „GmbH“ are not freely tradeable but rather are bound to a person. The shareholder has limited liability – the share capital of 25,000 €. To form a „GmbH“ a starting capital of at least 25,000 € is necessary . Of this 25,000 €, at least half has to be deposited at the time of the formation (normally paid into a bank account). The „GmbH“ is formed through a notary and is based on a document called „Company Agreement“ ( where place of business, business purpose, shareholders and directors are mentioned). In Germany there is also a „light version“ called „UG“. The advantage of a German „UG“ is that it can be formed with a limited start capital. At the same time it has the disadvantage , that the „UG“ is not particularly held in high esteem in Germany. When you consider that this legal form lacks substance, from a financial point of view, it is hardly surprising that one has a sceptical view of this legal form. One also has to consider that a „UG“ has to save 25% of the profits until the 25,000 € share capital is accumulated. Then the UG will be rebranded to a GmbH. The founder of a „UG“ has to ask himself the question how important the reputation of the German company (to be founded) is for business operations. If low-priced products or services are sold or if the customer only pays after delivery, then the weaker standing of the „UG“ (in comparison to the GmbH) is not very important. If, however, high-quality products/services or long-lasting products are sold, then the reputation is much more important. German customers want to be sure that the business partner will be available even after a few years. With this in mind, the „GmbH“ would definitely be the better option here. That does not mean that the „UG“ is not a meaningful company form. 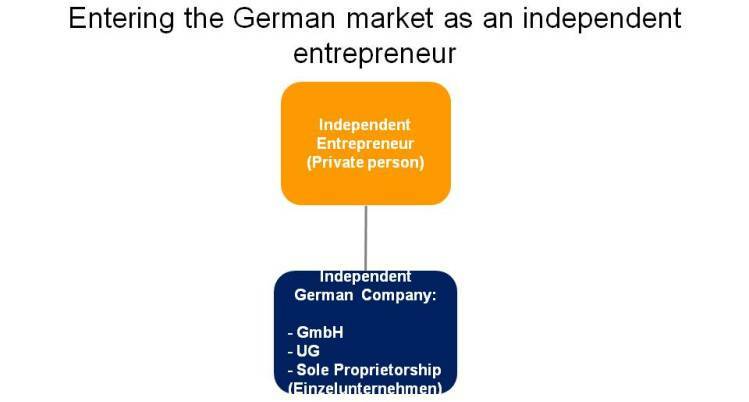 The „UG“ can be a suitable legal form for an entrepreneur who only needs a German entity because of certain formalities. On top of this, a „UG“ can be converted to a „GmbH”. One just has to take into consideration that the conversion can only take place when the complete minimum start capital of 25,000 Euro has been generated (and not just with half of the necessary share capital). For this an appointment would need to be made again with the notary. One can also form a sole proprietorship in Germany. This is called „Einzelunternehmen“. The significant difference between a „GmbH“ and an „Einzelunternehmen“ is that as an „Einzelunternehmen“ one is liable with all personal assets. A further difference is that with an „Einzelunternehmen“ a notary does not need to be employed and a start capital of 25,000 € is not necessary. Also an „ Einzelunternehmen“ has to be a real person. This means that an American company cannot form a German company as an „Einzelunternehmen“. The independent business owner must register in the town where he has his place of business. As the “Sole-proprietorship” is directly linked to the business owner, they should genuinely carry out their business at the registered office and should be mainly on-site there. It is not necessary to register in the Company Registry, but it is possible. In this case, the company name would be supplemented with „e.K.“ („eingetragener Kaufmann“/“registered sole trader“) . This gives a reliable and professional impression. Are you considering to do business as an entrepreneur in Germany? Then you are faced with a lot of questions and decisions. INDIPA can help you with this. With our long years of experience, we already have answers for a lot of your questions. For the other questions we will definitely find a solution together. 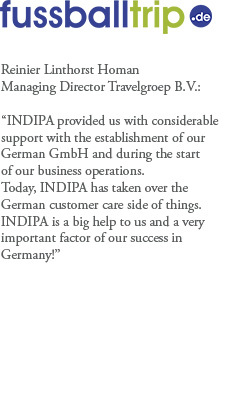 INDIPA would be happy to support you with the formation of a “GmbH”, an “UG” or an „Einzelunternehmer“. As a complete neutral party we deal with all the administrative obstacles on your behalf and – after careful consideration – we prepare everything that is necessary for you . We organise one day (where it is necessary that you are present as founder) to sign the documents at the notary and to open a business bank account. As well as that, we would be happy to accompany you to the notary, assisting you with translation of the documents, and to the bank to open the business account for the “GmbH i. Gr.” (“GmbH in formation”). 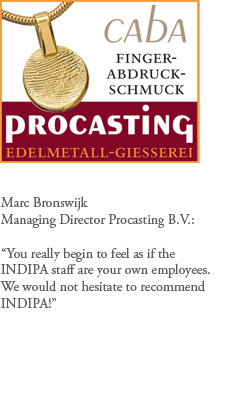 If you would like to register as an “ Einzelkaufmann” („Sole-proprietorship“), INDIPA is also available for you. Get in contact with us also concerning this. Even after the formation of a “GmbH” or “UG” or registration as “Einzelkaufmann”/“Sole proprietor”, we are on hand as a professional partner with help and advice for you. We can take over, for example, the internal sales of our customers. 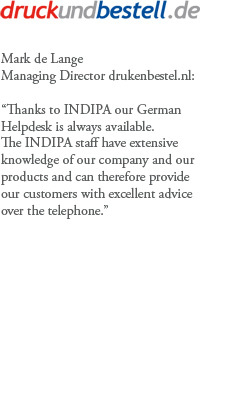 Or we can support your company in Germany with the administration so you don‘t get stuck in the „German paperwork jungle“!